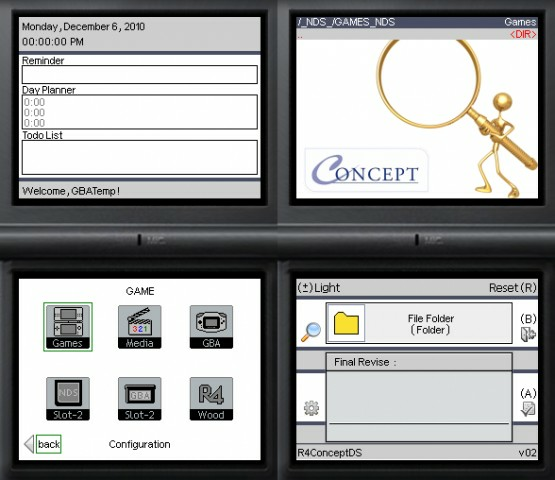 R4ConceptDs is a compilation of homebrew, which can be used as replacement firmware for R4DS and M3DSSimply. GAME, MEDIA, GBA, NDS_Slot2, GBA_Slot2 and R4Wood. R4ConceptDs has the ability to run roms via Moonshell 1.71 and DSOrganize browsers: (see "Set Favorites" for more information!). _Put your files in "_NDS_" folder. In _NDS_/Favorites folder, there are plugins numbered "01" to "20" that can be renamed to the name of the rom that you want to play. Exemple: 01-Avatar The Game.nds, keeping the number for easy identification. Then enter the folder TTMenu: Edit the file RENAME.INI with Notepad, then rename the last line to the rom that you want to play. That's it. Then just play roms in Moonshell 1.71 and DSOrganize browsers through the folder Favorites. Note: (do not modify anything inside the "R4ConceptDs" folder, except "Set Favorites"
YSMenu, DSOrganize, Moonshell, Wood R4, GBA_ExpLoader and others.